Johannesburg- (Miningweekly.com) – Every year, 700 000 to 800 000 young South Africans leave school with extremely limited prospects of obtaining employment, adding to the statistic of three- to four-million people younger than 25 who are already unemployed. One of the country’s most pressing challenges is finding ways of preparing these young people for employment and life as adult citizens in a constitutional democracy. (Also watch attached Creamer Media video). 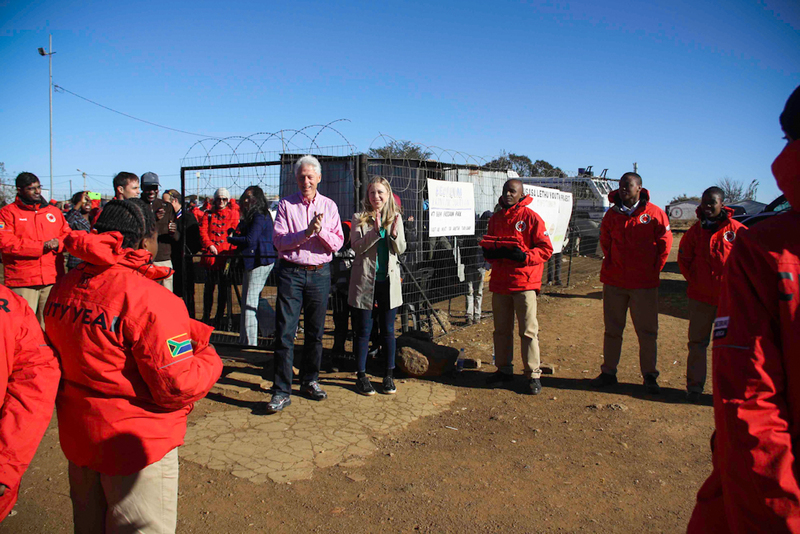 An organisation that has been meeting those needs is City Year, which began functioning ten years ago in the offices of the former Anglovaal Mining (Avmin) in Main street, Johannesburg. Co-chaired by anti-apartheid struggle stalwart Murphy Morobe and former Avmin CEO and banking luminary Rick Menell, City Year would now like to see the concept of a year of voluntary youth service spreading beyond Johannesburg to South Africa’s other main urban centres. So far, it has provided 1 683 young people with the chance to perform voluntary after-school tutoring and mentoring of 23 000 school children, with the volunteers using the year as a launch pad into a wide range of careers, entrepreneurship and new learning opportunities. “It’s the cheapest way to prepare people for the world of work,” commented Menell, who heads Credit Suisse South Africa. Willingness to offer help voluntarily to others is seen as a way of building a society that “isn’t all me, me, me; grab, grab, grab”, he added in the attached video interview with Creamer Media’s Mining Weekly Online. Volunteers of all races are screened for demonstrated commitment to community service and must have matriculated because of the role they play in helping younger children with their academic work. “Often we get graduates from university. We try to get as much diversity as we can to show that South Africans, arm-in-arm, rich and poor, can engage together in voluntary work,” Menell commented to Mining Weekly Online. Limited resources have restricted the yearly intake to between 100 and 200 volunteers a year, but City Year is now increasingly being seen as an enormously valuable model that the country should expand. “I believe we have the basis for scale,” Morobe, the national director of Jika iMfundo, told Mining Weekly Online. City Year receives 40% of its funding from the public sector and 40% from South African and foreign corporates, with most of the mining houses and banks coming to the table and many individuals and foundations putting their hands in their pockets. It costs between R40 000 and R50 000 a volunteer a year, which is much higher than the R18 000 set as standard for youth service, which City Year believes is inadequate. There is, thus, a funding challenge, but return on investment a year is enormous when one takes into account the opportunity cost of having people in their twenties and thirties being out of work indefinitely. It is seen as being cheap when the full impact on people’s lives is taken into account, particularly when the number of younger learners who are tutored and mentored by volunteers is considered. “We would love to see hundreds of thousands of youth doing a year of service. We think it would transform South Africa,” said Menell, who is also deputy chairperson of Gold Fields and a non-executive director of Sibanye Gold and Rockwell Diamonds. But that would require a constellation of organisations and a central government funding mechanism. It would generate the take-up of a sophisticated service model that is a far cry from initiatives like the expanded public works service, where participants dig for six months, receive a stipend and walk away with little but the ability to work with a shovel. “A strong element is about initiative. Once the self-confidence is built up, these people exhibit a strong sense of initiative,” said Morobe. (Also watch attached Creamer Media video). Ten per cent of the graduates have founded their own businesses. One of the alumni, Daylene van Buuren, currently runs the organisation as City Year South Africa executive director; and another, Danny Tong, founded the InvesTong Group, a multidisciplinary 100% black-owned investment holding company, and this year became the first past graduate to donate to the City Year programme. Teams are challenged to leave a legacy project in the schools where they have served for a year, such as a feeding scheme, a market garden or a library. “We believe voluntary civilian social service – not military service – is the best model,” said Menell when asked to comment on the national youth service initiative proposed by the investment banking division of Goldman Sachs, which proposes that 300 000 unemployed youth become part of a National Defence Force programme over the next five years. South Africa’s youth development policy of 2004, which was introduced by the Mbeki administration and which remains today, is seen by City Year as being sound and centred on developing youth entrepreneurship as a way of providing opportunity, education and training initiatives. It is regarded as a clearly articulated programme, offering youth a chance to do useful social service for a year while being trained for at least 40% of the time that they commit. The volunteers are paid a stipend so that they have sustenance, can make decisions about income and gain work experience. City Year is thus entirely aligned to the objective of South Africa’s national youth policy, making it one of a handful of organisations that is officially accredited. Many of the members of its volunteer teams who tutor eight- to-14-year-old school pupils are from single-parent or no-parent families and it has been found that a caring mentor can change young lives and have a huge impact if taken to scale. 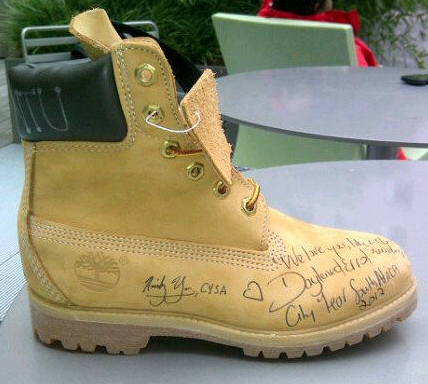 With the mantra of spirit, purpose, discipline and pride, the volunteers used to be dressed in uniforms that Timberland provided. One of City Year’s biggest supporters has been the Department of Environment Affairs, which is currently providing the organisation with R5-million a year and with which City Year is partnered as an implementer of the Youth Environmental Service Programme launched in 2013. 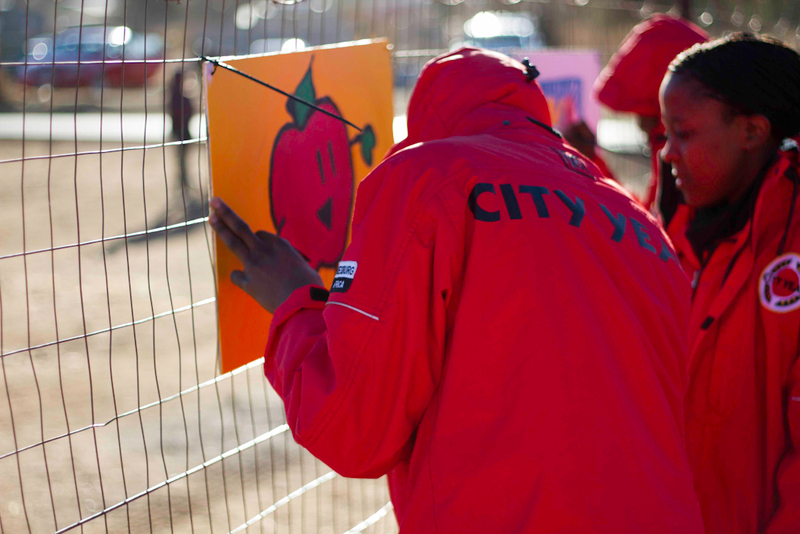 As a nonprofit organisation for people between the ages of 18 and 25 who have provided more than a million hours of service, City Year serves nine primary schools across Gauteng in Tsakane, Tembisa, Sebokeng, Meyerton, Randfontein, Westonaria, Kagiso, Diepkloof and Lawley. Founded in Boston, Massachusetts, in 1988, it is active in 27 communities across the US and has international affiliates in London, Birmingham and Manchester, in the UK. Menell’s own commitment to the sector was triggered personally in the early 2000s when he was driving to a luxury game lodge in Sabi Sabi and passed a high school from which 400 incredibly bright-faced energetic youth were leaving for the day and pouring out into the street jabbering and engaging. Owing to his work in the private sector with corporate social investment programmes, he was well aware that only 5% of those 400 had any chance of getting gainful employment and improving their lives. “It’s a shocking statistic. I just looked at these kids and I thought, my God, what a tragedy. “And that’s what drives us and I think it drives everybody who cares for the country,” Menell confided. He loves the Goldman Sachs numbers of training 300 000 young people at a cost of R62-billion over five years, which is more than R200 000 a head a year, but calculates that 100 000 youth in service would require 10 000 team leaders, or sergeants, and 1 000 officers to manage it. He regards City Year as being a potential training ground for those thousands of team leaders and mentors. “Military service is admirable service to society but it’s within a command and control environment of ‘break them down and then build them up’, so that they obey orders. “That’s not what we’re about. We’re about self-directed citizens who are volunteering to serve their fellow citizens in a thoughtful and a principled way through work – a military process cannot achieve those values in the same way,” Menell contended. Morobe suggested that Goldman Sachs might consider grafting some of the City Year values into its proposed programme. “It’s easy to get the 300 000 people but once you’ve got them, what’s the model, what process do you take them through, for them to come out on the other side with a set of values that links up with the constitutional paradigm of a new democratic environment, a work ethic and their ability to conceive of how they fit in to an adult life in society,” he queried. City Year spreads the message of voluntary service being a vital tool for dealing with youth unemployment and also for consolidating a successful constitutional democracy. Copyright Creamer Media (Pty) Ltd. All rights reserved. On Friday, the City Year South Africa 2014 corps burst through the doors of our event space, generously donated to us by Bain Capital, and got the proceedings started with a truly South African version of City Year’s PT. Click on the photo below to watch a video of the corps performing PT. After Daylene van Buuren, our Executive Director, opened the ceremony for us, we moved into the jacketing part of the programme. This was the first time that the corps had worn their jackets, and they looked incredible! We were honored to have two guest speakers at our event, Ms. Nomfundiso Giqwa, Director of Programme Training and Youth Development from the Department of Environmental Affairs, and Mr. Paul Marchand, Senior Vice President at Bain Capital. Both Ms. Giqwa and Mr. Marchand, spoke of the impact that City Year has, not only on the lives of the children who are tutored by our corps members, but also the impact that the programme has on the corps members themselves. As you know, at the end of last year, City Year South Africa lost a gentleman who was very near to us – Former President Nelson Mandela. As one of our founders, we felt his death quite keenly, and wanted to pay tribute to the man who gave us so much. 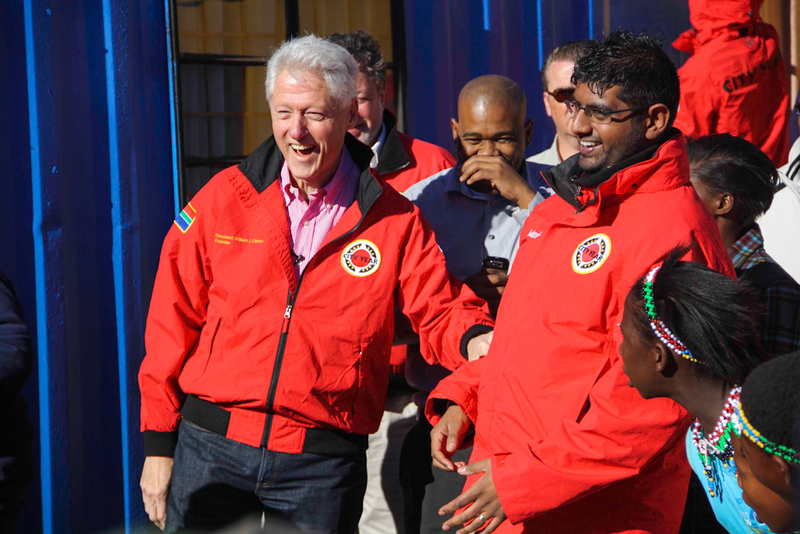 The City Year South Africa choir, together with a group of corps members performed a tribute to Tata Madiba, and presented our board co-chairs with a City Year jacket dedicated to our beloved Madiba. Click on the photo below to watch a clip from the Madiba Tribute. The ceremony was closed by our board co-chairs, Mr. Murphy Morobe, and Mr. Rick Menell, who left the corps with some incredibly inspirational words of encouragement. Now that their training is complete, and they are decked out in their new uniforms and red jackets, our corps will fulfill their roles as tutors, mentors and role models to children throughout Johannesburg. Monday is their first day in schools, and we can’t wait to share their stories with you as they unfold! My team serves in Kagiso on the West Rand, at WD Oliphant Primary School. There is a grade 6 boy who is part of our after-school programme, and struggled with mathematics, especially multiplication. His lack of understanding made him reluctant to participate in class. And in this case, when the learner was unwilling to do certain tasks, it led him to be destructive in class. One of my teammates noticed that he was not paying attention in class, and approached him. With a with a calm voice she asked, “What seems to be the problem?” He replied, saying he didn’t understand and was not interested. At first the boy resisted the daily help he received from my teammate. She had heard that no matter what she did to help, the learner would keep on disappointing her. It is better to leave him alone, she was told. But she was committed to helping him. She didn’t take the nasty things she had heard about the young boy into consideration. She ignored the stories, and was determined to be open-minded. I think she doesn’t believe in the word, impossible. The way she attended to him was so warm and friendly, that the learner soon opened up to her. She explained how to do multiplication in different ways. Ways that he could understand and follow. She reminded him that in mathematics, there are many ways to arrive at an answer. Before long the boy started to see the light, and we started seeing wonders. I was so astounded, as was his teacher, by his development and progress. His classwork scores soared and by him improving, he started enjoying mathematics. But most of all, he restored his love of learning. City Year has only been in the school for a few months, but we have Service Leaders that are already having an impact on children’s lives. I’m thrilled at how quickly we managed to really help someone, and we still have plenty of time before the end of the year to make more of a difference. When I found out which community I would be assigned to for my year of service, my face filled with fear. I felt uncertain about how exactly I would be able to make a difference in an unfamiliar place, and a totally different community to the one I grew up in. But that fear and apprehension all disappeared after the warm welcome my teammates and myself received from the school we would be serving in. Once I had spent time interacting with learners in the classroom, I was struck by the overwhelming sense that my presence was highly appreciated, and that just by being around, a change had already been made. After settling in, I discovered that, as is often the case, learners were being paired according to their academic capabilities. I found this to be limiting, and wanted to create a space in our after-school programme where all my learners had the opportunity to excel and flourish. I wasn’t sure exactly how to go about creating that space, and thought that in order for me to achieve the idea I would need the help of someone wiser and more experienced. But I also came to the realization that if I was able to identify the challenge, it was likely that I also possessed the ability to work on it and overcome it. As I identified learners who were having trouble with certain subjects, I started having one-on-one conversations with them, to discover exactly how they viewed their lessons in class. I discovered that the challenge lay in their ability to understand and unpack the lessons they were given. So I decided to try something a little different. I started using cue cards as a means to improve their literacy skills, and to my surprise that provided a lot of help. They loved it so much that they eventually took over the responsibility of creating the cards themselves. My job suddenly became a lot easier, because the students became eager to learn. Helping those learners improve their ability to read and write was rewarding, but what has made my experience as a Service Leader worth it, was one learner in particular. He isolated himself from all the activities, and was always distracting the other kids in class. Approaching him about his behaviour was a challenging experience, because most people had already given up on him. But all it took was one conversation with him. I was deeply touched by the way he spoke to me, revealing how inferior he felt amongst all the other students. His difficulties were not rooted in being a problem child, but rather in how he had never been given a chance to truly express himself. I spent time working with him over the next few days, and was over the moon when he scored over 70% for a spelling test the following week. But the best part, was the light I saw in his face whenever an educator was in class. The doubt I had in myself at the start was the same doubt he had in himself, and I would like to believe that by us coming together, we were both able to overcome the uncertainty that had trapped us. It is my honour to have met him, and helped him achieve what he is truly capable of. Born an raised in Orlando West, in Soweto, Lindiwe first joined City Year in 2009 as a Service Leader in Lenasia, and recently joined the staff as a Site Leader overseeing the team serving at Bapedi Primary. 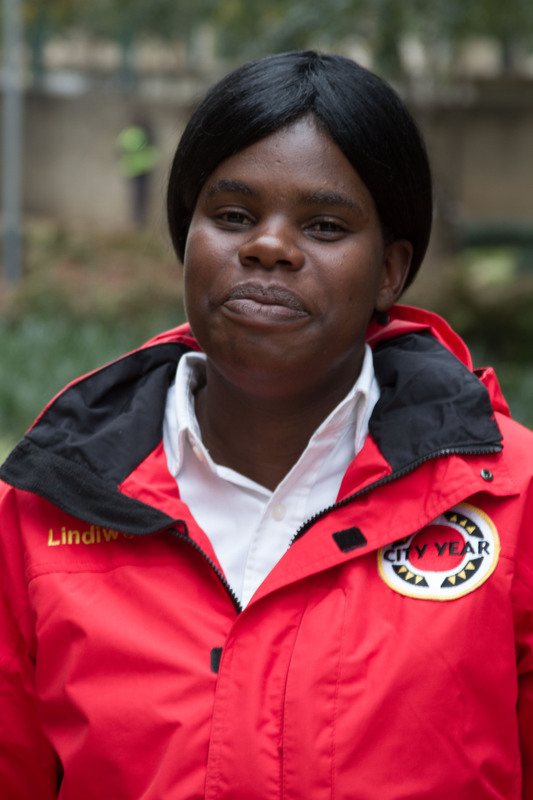 Lindiwe, how did you hear about City Year and what motivated you to join the organisation? I first heard about City Year in 2007 while I was living in Lawley, in the south of Johannesburg. City Year had (and still has) a team working there, and I talked to Service Leaders about the work that they were doing. Their passion for service motivated me to join the organisation, along with my love for community service. Meeting amazing people. 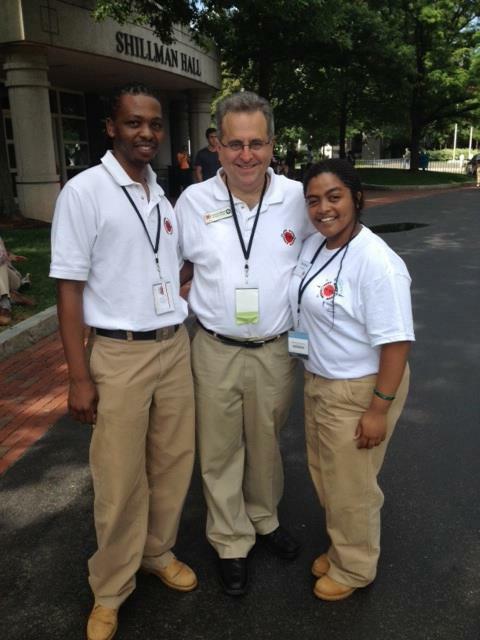 Last week I was fortunate enough to meet City Year’s Dean, Charlie Rose. I’ve heard so much about him, and it was great to finally meet him in person. City Year exposes us to a huge amount of inspirational and interesting people, which I really appreciate. During my year corps year we arranged and hosted a service day in the community in which our team was based. It was a huge event that involved our entire corps, and went off extremely well. What is your favourite thing to do outside of City Year? I love athletics. I joined the Orlando Athletics Club in 1999 and subsequently joined the Diggers Athletics club in Turffontein. I competed in 100m and 10km events, and more recently I have taken up speed-walking. Why do you think it’s important for young people to commit to a year of service? A year of service affords you the opportunity to do a lot of introspection and figure out exactly what it is you want to do in life. You are also introduced to all kinds of people, which helps you develop a sense of perspective about where you fit into the world. Probably the two most significant things I have learned at City Year are the importance of respect and the spirit of Ubuntu. My son, Modimomphemetse. He is 4 years old and is the light of my life. 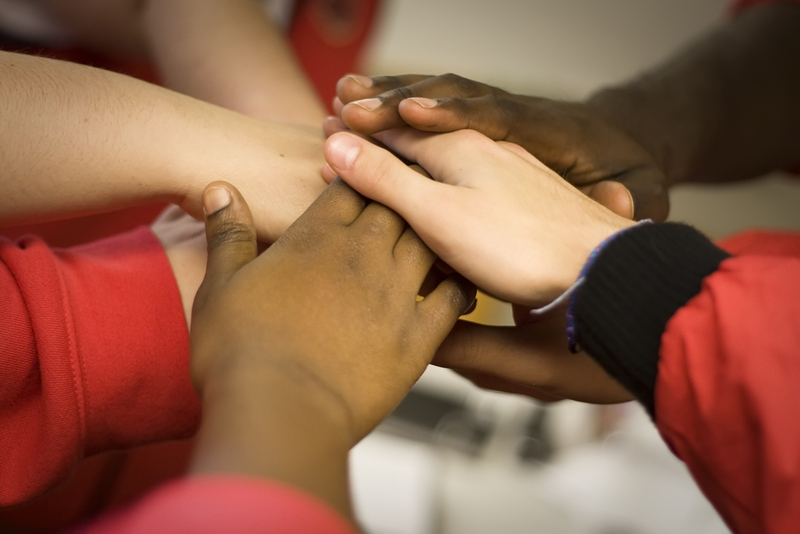 The spritual foundation of South African society, Ubuntu involves a belief in a universal bond of sharing and respect that connects all of humanity. Ubuntu is a concept formally recognised by the 1996 South African Governmental White Paper on Welfare as, “The principal of caring for each other’s well-being…and a spirit of mutual support…Each individual’s humanity is ideally expressed through his or her relationship with others and theirs in turn through recognition of the individuals humanity. Ubuntu means that people are people through other people. It also acknowledges both the rights and responsibilities of every citizen in promoting individual and societal well-being. Ubuntu also conveys the idea the a person cannot be complete if others do not enjoy full humanity. The spirit of Ubuntu resonates so strongly that if one group within society is denied its humanity, then no individual in that society can fully realize his or her own humanity. The urgency to change this injustice becomes paramount. 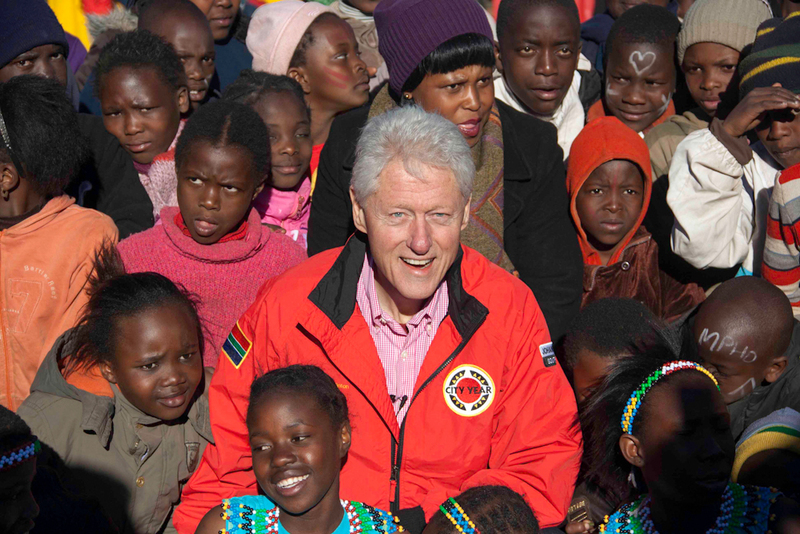 We can put the spirit of Ubuntu – respect, human dignity, compassion, and community – to work in our daily lives through our interactions with others, from greeting others as we pass them in hallways or on the street to ensuring that all segments of society are included in social welfare policies so that each person has the means to lead a life of dignity. Ubuntu has the power to help us build an inclusive, respectful, and vibrant community nation and world. Text taken from City Year’s book of Founding Stories. The City Year Logo is not just a random collection of shapes and letters. Each part has a very special significance and meaning. Read more about what makes up this symbol of idealism below. Click on the picture to enlarge the text. 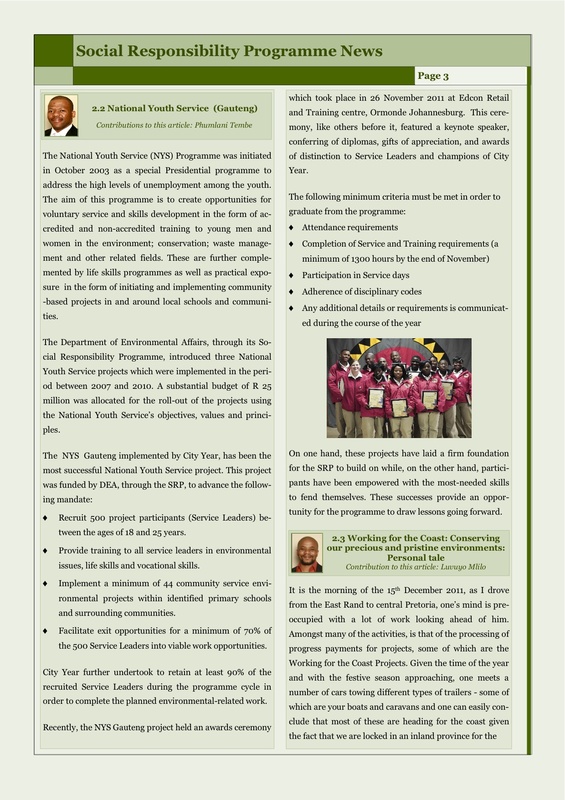 In a newsletter published this week, one of City Year South Africa’s long-term supporters, the Department of Environmental Affairs, has named the organisation as its most successful National Youth Service Project. Read more by clicking on the image below.